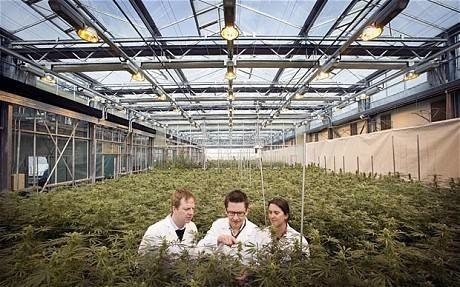 Dr. Ben Whalley, middle, with Dr. Gary Stephens and Dr. Claire Williams at their secret cannabis farm near London. These researchers have discovered that three compounds found in cannabis leaves can help to reduce and control seizures in epilepsy. Dr. Whalley, who is leading the research at the department of pharmacy at the University of Reading, said tests in animals had shown the marijuana compounds effective at preventing seizures and convulsions while also having fewer side effects than existing epilepsy drugs. tumor growth in laboratory animals and also kill cancercells. Their use in the case of childhood cancer is compassionate. And lucky for us, cannabis is also an excellent treatment for radiation sickness and exposure. With all the radiation that is now entering our atmosphere, it is urgent that we now all start ingesting a list of natural medicinals to diminish our reactions to radioactive particles the damage this radiation will cause. One of my favorite people, Rick Simpson, the man in Canada that has helped many cancer sufferers with THC-laden hemp oil, has a lot to say to people as we go into our increasingly irradiated future. "If used properly, high quality hemp oil can provide a solution that will be of help to mankind in alleviating the effects of increasing radiation. Through my experience with the use of this oil, I have found that there is nothing more effective or more harmless that can reduce the damage caused by radiation. "I have seen patients suffering from cancer who were badly damaged by the effects of radiation treatments and who were able to completely eliminate the damage in a short time. Some who have come to me that had radiation treatments were burned so badly by its effects that their skin looked like red leather. After ingesting the oil treatment their skin went back to its normal healthy state and the radiation burns disappeared completely. If the oil can do this for someone that was badly damaged by such so-called medical treatments, would its use not be effective to combat the effects of the radiation now emanating from Japan? Now with the menace that all this escaping radiation presents, we would have to be insane to turn our backs on the use of hemp extracts to help us all deal with this situation." and significantly reduces the ability of the cancer to spread. Scientific trials have for decades documented the anti-cancer properties of cannabis and its constituents. Yet it took until this week for the website of the National Institute of Cancer, a component of the U.S. government's National Institutes of Health, to finally acknowledge the herb's therapeutic utility for patients living with disease or suffering from the adverse side effects of cancer treatment. In test-tube experiments, researchers at the National Institutes of Health (NIH) in Bethesda, Md. exposed rat nerve cells to a toxin that is typically released during strokes. Cannabidiol reduces the extent of damage reported the National Academy of Sciences. More effective than vitamins C or E, strong antioxidants such as cannabidiol will neutralize free radicals and so might limit the damage and reduce the severity of radiation. It takes the average person about 90 days to ingest the full 60-gram treatment. I suggest that a person start with 3 doses per day about half the size of a grain of dry rice. A dose such as this would equal about 1/4 of a drop. After four days at this dosage, increase your doses every four days until you are at the point where you are ingesting about 1 gram in 24 hours, so each dose should equal 1/3 of a gram. It takes the average person about five weeks to get to the point where they can ingest a gram per day. Once they reach this dosage they can continue at this rate until the cancer disappears. A gram is just slightly less than 1 milliliter. Using this method allows the body to build up its tolerance slowly; in fact, I have many reports from people who took the oil treatment and never got "high". We all have different tolerances for any medication. Your size and body weight have little to do with your tolerance for hemp oil. When people are taking the oil, I like to see them stay within their comfort zone, but the truth is, the faster you take the oil the better the chance of surviving. At the end of their treatment most people continue taking the oil but at a much reduced rate. Six to 12 grams a year would be a good maintenance dose. I do not like to see people overdosing on the oil, but an overdose does no harm. The main side effect of this medication is sleep and rest, which play an important role in the healing process. Usually, within an hour or so of taking a dose, the oil is telling you to lie down and relax. Don't fight the sleepy feeling, just lie down and go with it. Usually within a month, the daytime tiredness associated with this treatment fades away but the patient continues to sleep very well at night. The only time I would recommend that people start out with larger doses would be to get off addictive and dangerous pain medications. When people who are using such medications begin the oil treatment, they usually cut their pain medications in half. The object is to take enough oil to take care of the pain and to help the patient get off these dangerous pharmaceutical drugs. Taking the oil makes it much easier for the patient to get off these addictive chemicals. I simply tell people the oil will do one of two things; it will either cure their cancer or in cases where it is too late to affect a cure, the oil will ease their way out and they can at least die with dignity. Hemp oil has a very high success rate in the treatment of cancer; unfortunately many people who come to me have been badly damaged by the medical system with their chemo and radiation, etc. The damage such treatments cause have a lasting effect and people who have suffered the effects of such treatments are the hardest to cure. It should also be mentioned that the oil rejuvenates vital organs like the pancreas. Many diabetics who have taken the oil find that after about six weeks on the oil that they no longer require insulin since their pancreas is again doing its job. Properlymade hemp medicine is the greatest healer on this planet bar none. Once you experience what this medication can do you will understand why history and I call hemp medicine a cure-all. I recommend that you grow your own hemp either in a small indoor grow system or outdoors. Growing it yourself will eliminate the high cost associated with buying hemp from drug dealers. The cost of hemp can vary greatly from dealer to dealer and so can the quality of the hemp. For anyone new to growing hemp, a good book or video on the subject is a necessity. If you go to Cannabis Culture, the good people there should be able to point you in the right direction. Oils that drug dealers sell can have many contaminants and often little or no THC. From my experience, most hemp oil available on the street should be avoided for medicinal use. Make your own oil or have someone you trust produce the oil to assure a very pure, high-quality oil is produced. How much to make and take? One pound (500g) of bone-dry hemp buds will usually produce about two ounces (55-60 mL) of high-grade oil. This amount of oil will cure most serious cancers; the average person can ingest this amount in about three months. This oil is very potent so one must begin treatment with small doses. A drop of oil about half the size of a grain of rice, two to four times a day is a good beginning. After four or five days, start increasing your daily dosage very gradually. As time goes on the body builds a tolerance to the oil and more and more can be taken. In cases where people are in a great deal of pain, I recommend that their dosage be quickly increased until it kills the pain. High quality hemp oil will stop pain even when morphine is not effective. The oil can be applied to external injuries for pain relief in minutes. Following the dosage previously described, many people can take the full treatment and never get high. In regards to hemp, getting "high" is a joke; even if a person does take too much oil the effect wears off quickly and no harm is done. No one has ever died from the use of hemp medicine. Is this the same as hemp seed oil? No! This is hemp oil, made from the bud and small leaves of the hemp plant. It is the essential oil of the hemp plant. Health food store sells oil made from hemp seed that is often mislabeled as hemp oil. Although seed oil is very beneficial, it does not contain enough THC to have any effect on cancer and other serious illnesses. The word marijuana is one of over four hundred slang terms used worldwide to describe the cannabis and/or hemp plant. Are all hemp plants the same? When buying or growing hemp, procure a strain that has the highest possible THC content. To energize someone suffering from depression, I recommend a good Sativa strain. For most other medical conditions, I strongly suggest that Indica strains be used. Indicas relax a person and provide them with more rest and sleep. High quality hemp oil can be vaporized, ingested or used topically. Add the oil to creams and salves for external use. Where can I get information about making the oil? For someone new to making the oil I suggest that you go to "Run from the Cure". There you can watch our documentary in seven segments. Segment #4 shows how the oil can be produced at home or one can go to http://www.PhoenixTearsMovie.com and download the full documentary. You will need a high-speed internet connection and there is no charge. The process in the video could only be described as crude at best, but the oil that is produced will cure cancer. In reality, this medicine should be produced in a controlled environment, using distilling equipment, etc. to reclaim the solvent and to purify the oil. Most people do not understand distilling and do not have access to the required equipment. This is the reason such a simple method is described in the documentary, so if need be just about anyone can produce the oil. As in the video, again we stress that this process, if not done properly can be dangerous and we bear no responsibility if this educational information is misused. 1 - Place the completely dry starting material in a plastic bucket. 2 - Dampen the material with the solvent you are using. Many solvents can be used. I like to use pure naphtha but it costs $500 for a 45-gallon drum. You can use 99% isopropyl alcohol, which you can find in your local drug store. Alcohol absorbs more chlorophyll from the plant material than naphtha does. This gives oils made with alcohol a darker color but does not diminish the potency of the oil to any noticeable degree. Ether, naphtha or butane and many other solvents can produce oils that are amber and transparent. Granted these clear oils do look better but dark oil can be just as potent. If the process is done properly, little or no solvent residue is left in the oil. I have been consuming oils produced using different solvents for eight years with no harmful effects. You will require about two gallons of solvent to strip the THC off one pound of dry starting material. 500 milliliters of solvent should be more than enough to strip the THC from one ounce of hemp starting material. 3 - Crush the plant material using a stick of clean untreated (chemical free) wood or some such device. Even though the starting material has been dampened with the solvent, you will find that the material can be readily crushed. 4 - Add solvent until the starting material is completely covered. Use the stick to work the plant material. As you are doing this, the THC dissolves off the plant material into the solvent. 5 - Continue this process for about 3 minutes. 6 - Pour the solvent-oil mix off the plant material into another bucket. You have just stripped the plant material of about 80% of its THC. 7 - Second wash--again add solvent to the plant material and work it for another 3 minutes to get the other 20%. 8 - Pour this solvent-oil mix into the bucket containing the first mix that was poured off previously. 9 - Discard the twice-washed plant material. 11- Boil the solvent off. I have found that a rice cooker will do this boil off very nicely. The one I have has two heat settings--high and low--and will hold over a half gallon (2.5 liters) of solvent-oil mix. 12- Add solvent-oil mix to the rice cooker until it is about 3/4 full. 16- When there is about one inch of solvent-oil-water mix left in the cooker, put on your oven mitts, pick the unit up and gently swirl the contents. 17- Continue swirling until the solvent has been evaporated off. The few drops of water help release the solvent residue and protect the oil somewhat from too much heat. When the solvent has been boiled off, the cooker that I use automatically goes to low heat. This avoids any danger of overheating the oil. At no time should the temperature of the oil go over 290°F (140°C). 20- Place this container in a dehydrator or put in on a gentle heating device such as a coffee warmer. It may take a few hours but the water and volatile turpentine will be evaporated from the oil. When there is no longer any activity on the surface of the oil the medicine is ready for use. To anyone starting to use hemp oil as a medication, here are some simple facts. Hemp oil will lower blood pressure and if you are on blood pressure medication, you may find that this medication is no longer needed. The same is true for diabetics. I have seen hemp oil control blood sugar to the extent that insulin was no longer needed. I am not a doctor and I do not have the right to tell people what they should do. Personally, I would not consider taking any cancer treatments currently in use by our medical system; I do not recommend that hemp oil be taken along with chemotherapy. What would be the sense of making your own cure and then allowing the medical system to give you massive doses of poison? From my experience with hemp medicine, I have found that most pharmaceutical medications are no longer needed once a person starts using hemp oil. Hemp oil seems to mix well with most natural medications but I have had a few reports frompeople trying to take hemp oil and pharmaceuticals who experienced stomach pain etc. All problems ceased when they stopped taking the prescription drugs. To anyone who is going to act on this information to help a loved one, I welcome you to the world of real medicine. Again, I caution you to be very careful when boiling the solvent off. The fumes are very flammable. Be sure to stay away from red-hot elements, sparks, cigarettes, etc. That could ignite the fumes. I wish you the best luck and health. Yep, I'm surprised too. I always thought that marijuana was completely bad -- like all drugs. Thanks for this information. Marijuana to reduce seizures and convulsions? That's surprising... I have a question since I am no medical expert: is it true that marijuana can cause schizophrenia? Whereas I will not always agree with the feedback previously mentioned, at least that individual does indeed confirm a position. We have a tendency to get stuck up in the specifics and lose perception of the more prominent picture. This page contains a single entry by sal published on June 3, 2011 10:39 AM. WHY ANTIDEPRESSANTS CAUSE BRAIN DAMAGE, BREAST CANCER AND EARLY MORTALITY was the previous entry in this blog. Could Cell Phone Radiation be a Cause of Autism? is the next entry in this blog.